Gabriela Mistral was the pen name of Lucila Godoy Alcayaga, born in Vicuña, Chile. She attended the primary school taught by an older sister. By age 15, she was supporting herself and her mother by working as a teacher's aide in a seaside town near La Serena. In 1914, she won first prize in a national literary contest with Los Sonetos de la Muerte (Sonnets of Death). In 1921, she was named director of Liceo de Niñas #6 in Santiago. The following year, she accepted an invitation to work in Mexico on a plan to reform the country's libraries and schools and start a national education system. She returned to Chile in 1925 and retired from teaching. She was a visiting professor at Barnard College in New York City in 1930–1931, and worked briefly at Middlebury College and Vassar College, as well as at the University of Puerto Rico. 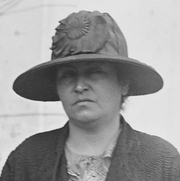 She also served as a Chilean consul from 1932 until her death. Gabriela Mistral is currently considered a "single author." If one or more works are by a distinct, homonymous authors, go ahead and split the author. Gabriela Mistral is composed of 7 names. You can examine and separate out names.